Our Antoinette Cannonball Bed has a timeless, handcrafted appeal. 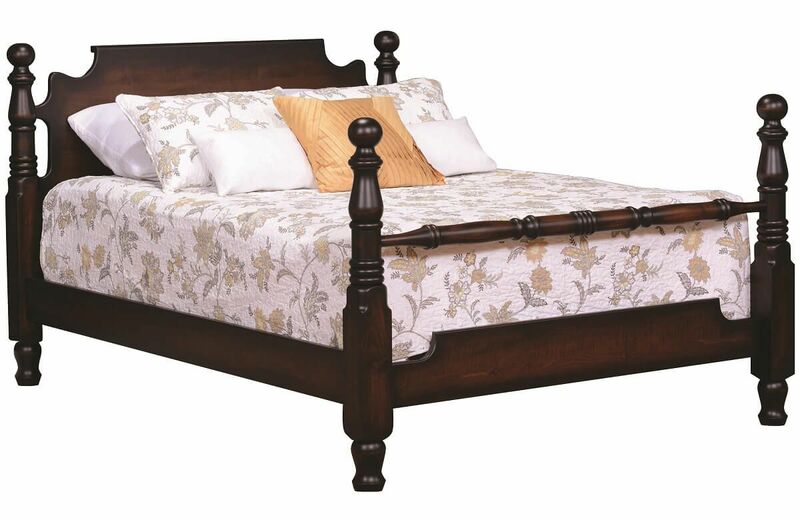 Using real solid wood, the Amish carefully create the finest made-to-order bed available. Warmth and beauty emanate from these beautiful solid hardwood beds. Available in standard twin, full, queen, or king, you are able to design an Antoinette Cannonball Bed to perfect complement your home. The natural wood grains bring out a lovely character not found in cheap synthetic materials. When investing in bedroom furniture, choose solid hardwood for a piece that can be handed down through generations. The handmade-to-order, solid wood cannonball bed is available in Oak, Brown Maple, Rustic Cherry, Rustic Quartersawn White Oak, Cherry, and Quartersawn White Oak. For the look as pictured, choose Brown Maple topped in a specialty Motley Bark wood finish. Your four post cannonball bed will be uniquely you. *Height from floor to bottom of side rail - 9 1/2"
**Height from floor to bottom of footboard - 9"